Valery Lunichkin is an accomplished Russian guitarist and an associate of Tony Carey, having worked on his Planet P projects 'Steeltown' and 'G.O.D.B.O.X'. 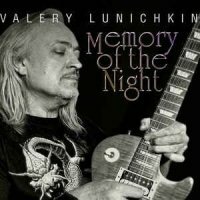 Noted for his incendiary playing, Lunichkin has created his first solo album 'Memory Of The Night'. This is an exceptionally enjoyable album and one that sounds very inspired by Gary Moore's Blues period. In fact, 'Tears Of The Moon' pays homage to Moore, being written exactly a year after his death; it also features Forrest Howie McDonald, the Texan Blues Rock veteran, on the main solo. The rest of the songs also emulate the Les Paul tone, vibe and feel of Moore's classic songs 'Parisienne Walkways' and 'Still Got The Blues'. Lunichkin has a soft Tenor voice which gives the album a relaxing feel, although he lets his guitar do the majority of the talking to be honest. The last three songs are Russian versions of the title track, 'Snowfall' and 'Rainy Streets'. I must say that the Russian language is such a beautifully musical one and it fits this style of music so perfectly that those songs work better than their English versions. As for the playing, Valery Lunichkin has a very fluid and expressive style which in turn provides a very sophisticated recording. The production, drums and keyboards are lush, laid back and have a bit of a Jazzy feel to them reinforcing the romantic style of the songs. I recommend this album and I would hope fans of Moore would especially enjoy this.